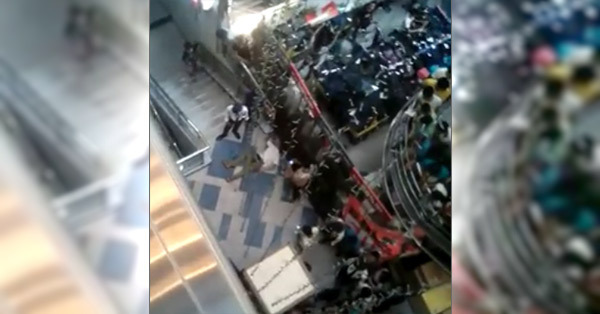 This video shows the man who jumped off the fourth floor down to the ground floor of Gaisano Mall in Cagayan de Oro City on Wednesday afternoon. Authorities identified the jumper as Dave Hernan Destajo, 22 years old and a resident of Sitio Kolambog, Barangay Lapasan. He is said to be suffering from Colic (a severe and often fluctuating pain in the abdomen caused by intestinal gas or obstruction in the intestines), according to his father. Hernando Destajo told SunStar Cagayan de Oro that his son skips regular meals and has difficulty sleeping at night due to insomnia. He admitted that the illness is hereditary. Dave hacked a chicken recently, the older Destajo revealed. He hid their bolo when his son experienced stomach pain just the other day. Dave's sister, on the other hand, disclosed that her brother is experiencing anxiety the past days. "He cannot understand what he feels. For him, anyone he sees is his enemy, that's why sometimes we are afraid of him," she reportedly said in vernacular. Dave, who has a student live-in partner and two children, was rushed to Northern Mindanao Medical Center after he jumped near the escalator and landed on the ground floor feet first. He got injured but is alive. Scary moment..around 3pm ganina this young man jump from 4th floor down to the ground floor at gaisano mall..in jesus name! !it happens every year nlang..dnt know why! !